If you're like most men, you've burned up lots of energy trying to figure out what a woman wants, what makes her tick, and how to make her happy.
. Why she can't "just not think about" something that's bothering her.
. How to get her real answers without games.
. How your provider instinct can actually cause her heartache - and what to do about it.
. Why "not tonight, honey" may not mean what you think.
. Why listening to her feelings is so hard for a guy, and a fix-it plan that works.
. Why her "I do" at the altar will always mean, "do you?" and the answer that rocks her world. Now updated with the latest scientific research to explain the fabulous female brain plus an all-new chapter that shows how to decode her most baffling behavior, For Men Only is your roadmap to making her happy. 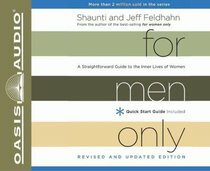 About "For Men Only, (Unabridged, 4 Cds) (And Edition)"
January 2008: Shaunti Feldhahn began her career as an analyst on Wall Street and today is a best-selling author, speaker, and nationally-syndicated newspaper columnist. Her recent bestsellers, For Women Only: What You Need to Know About the Inner Lives of Men, and For Men Only: A Straightforward Guide to the Inner Lives of Women, have led to great life-change - and plenty of fascinating conversation - for men and women around the country. Her newest books, For Parents Only and For Young Women Only, coauthored with youth speaker Lisa Rice, are causing buzz among parents and teenage girls respectively. She has also authored two true-to-life spiritual thrillers.Shaunti's background as an analyst is the launching point for the compelling and eye-opening nature of her books, talks, and columns. She holds a master's in public policy from Harvard University, and a bachelor's in government and economics from The College of William and Mary. Prior to becoming an author, she worked in the financial arena on Capitol Hill and later on Wall Street, analyzing the Japanese financial crisis for the highest level decision makers of the Federal Reserve System.As a national speaker, Shaunti travels extensively and has shared her findings with millions of people through conferences, television, and radio. She has appeared on such diverse media outlets as PBS, TNT, Soap Talk, The Alan Colmes Show, Focus on the Family, FamilyLife Today, and The 700 Club. Her weekly opinion columns are printed in fifty newspapers around the country, including the Atlanta Journal-Constitution, the Chicago Tribune, the Detroit Free Press, and The Seattle Times.Shaunti and her husband Jeff, with whom she coauthored For Men Only, are active leaders in their church and live in the Atlanta area with their two young children. Jeff Feldhahn is the president and CEO of World2one, a tech company that he helped found in 1999. Also an attorney, he graduated from Harvard Law School and has worked at law firms in New York and Atlanta specializing in corporate law and nonprofit organizations. Shaunti and Jeff are active leaders in their church and enjoy encouraging married couples toward greater intimacy with God and each other.